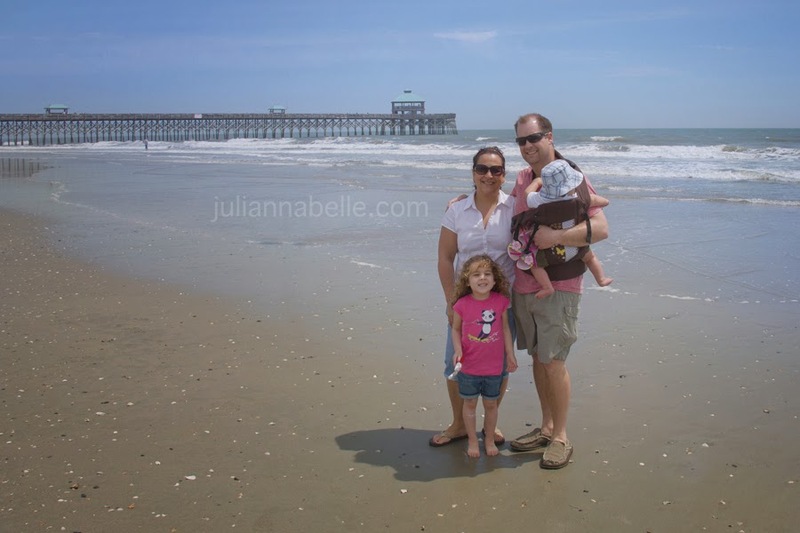 A few weeks ago, we took a quick trip down to the Charleston, South Carolina area to visit my inlaws. It was very nice to see my husband's family and spend some time with them. It was also so nice to be in the warm sun and hit the reset button on the winter-blues. 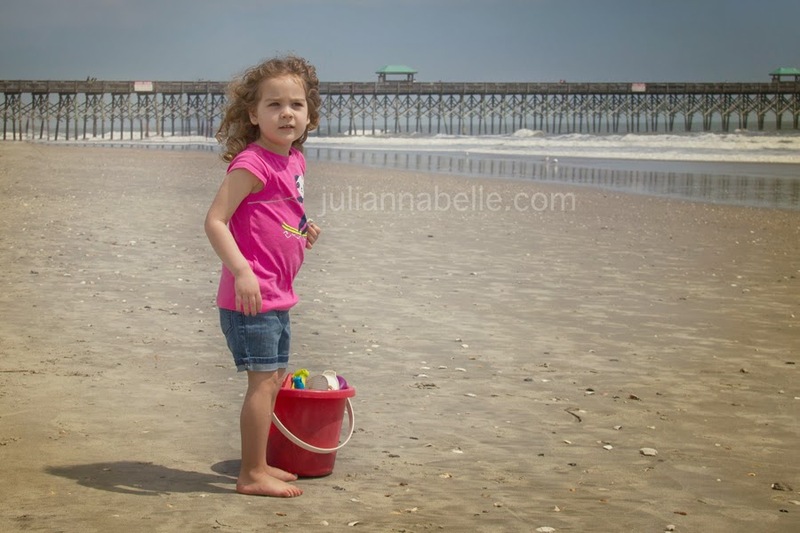 Julianna loves the beach. She hugged us all and thanked us for bringing her to the beach! This girl takes after us 100% with loving the warm outdoor weather. Rare family shot! Too bad Tyler was facing the other way! She thought nothing of sitting right on the wet sand and digging in! Tyler was touching the sand and deciding if he liked it. He then tried to put it in his mouth... and mama picked him right up and he was done with the sand after 6 seconds! 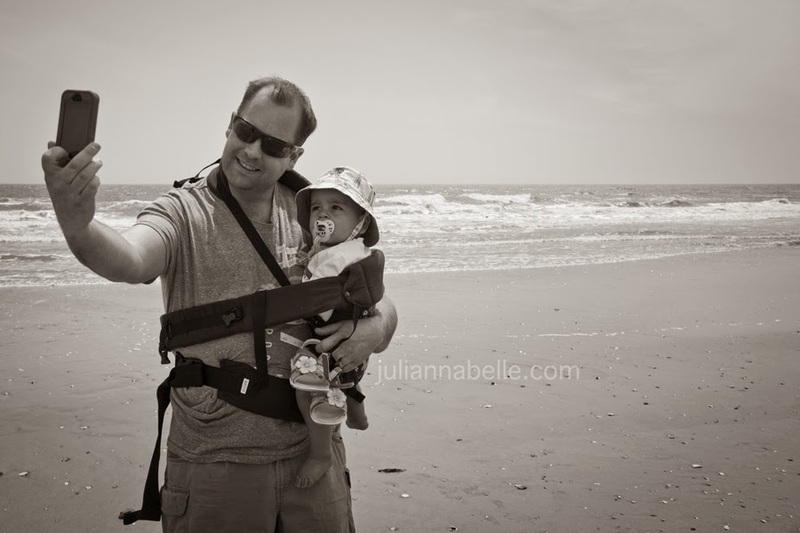 Me & my little boy! He did not like the sand on his feet - I put him down and he lifted them right out of the wet stuff! Running.... running... running! So much fun! 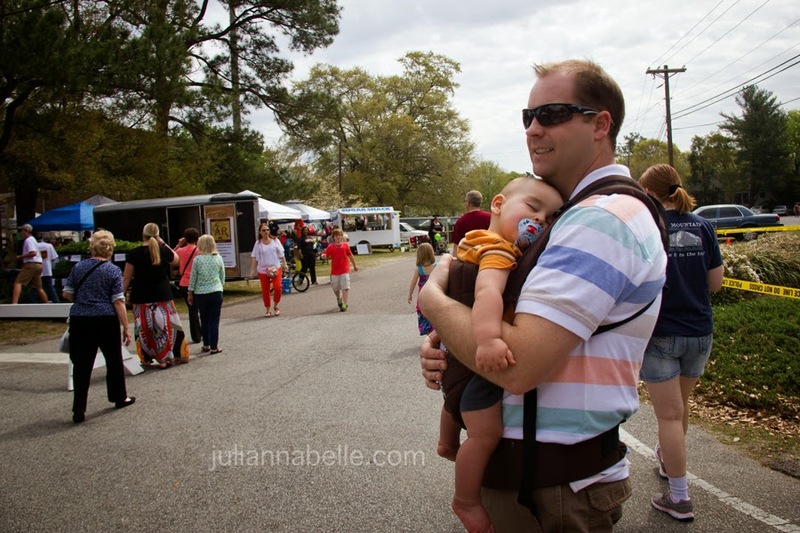 Ooh I forgot to resize this one - Daddy & Julianna browsing the festival. Too bad we don't have sidewalks here; she really had a blast with this! 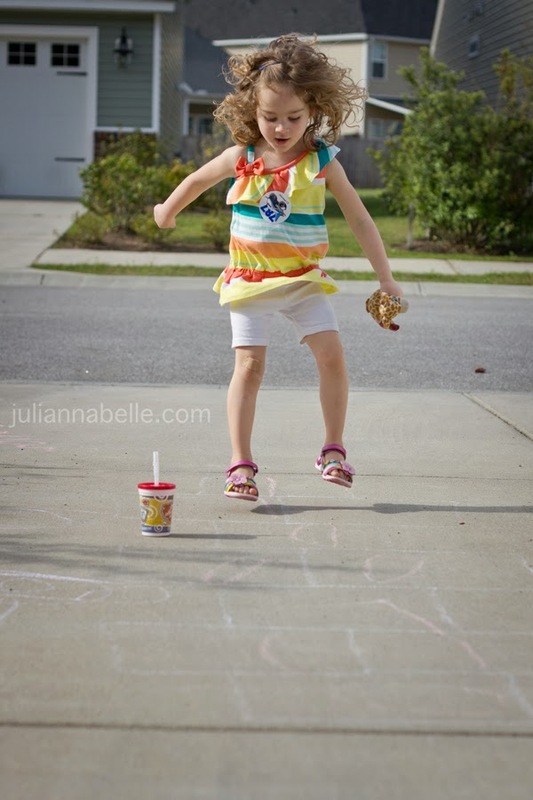 Hop-scotch on the driveway, with baby giraffe in hand! 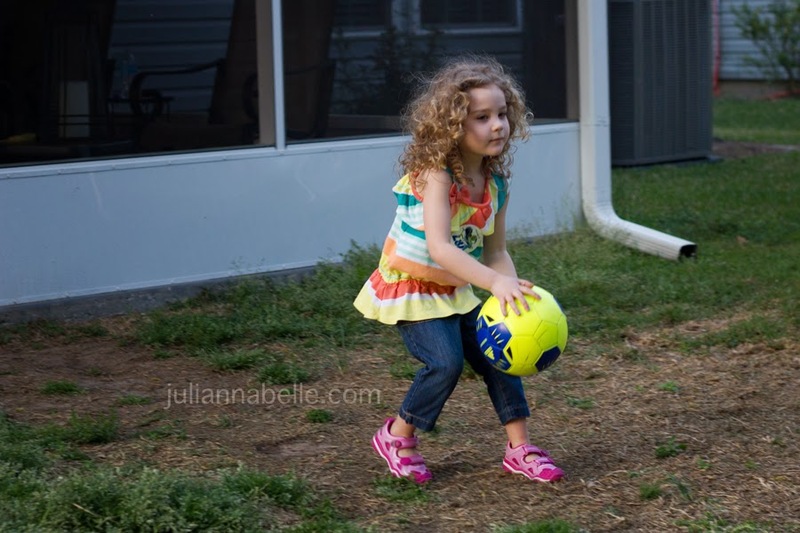 She also discovered the soccer ball! She wanted to play all weekend! Guess we'll get her one for her birthday next month! She'll be so happy. 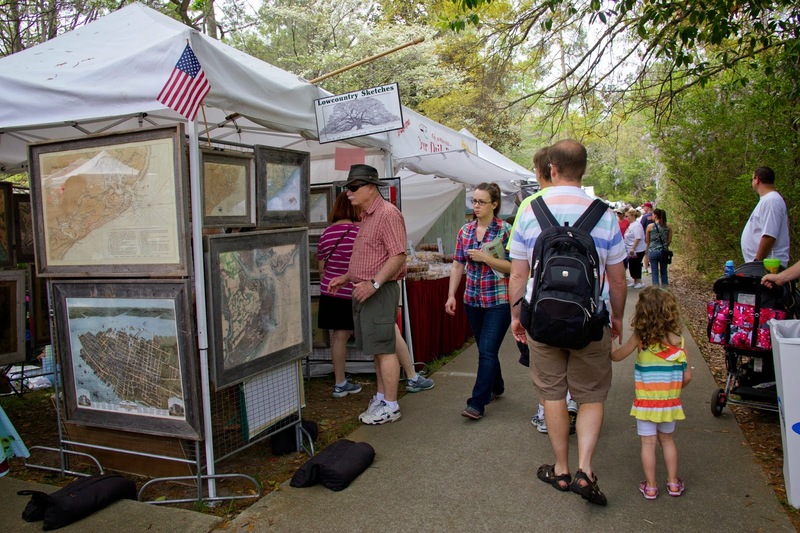 We had a great time, but it was a long drive there and back - 16 hours each way, with many many stops. I think we will fly next time! What beautiful pictures of your trip! 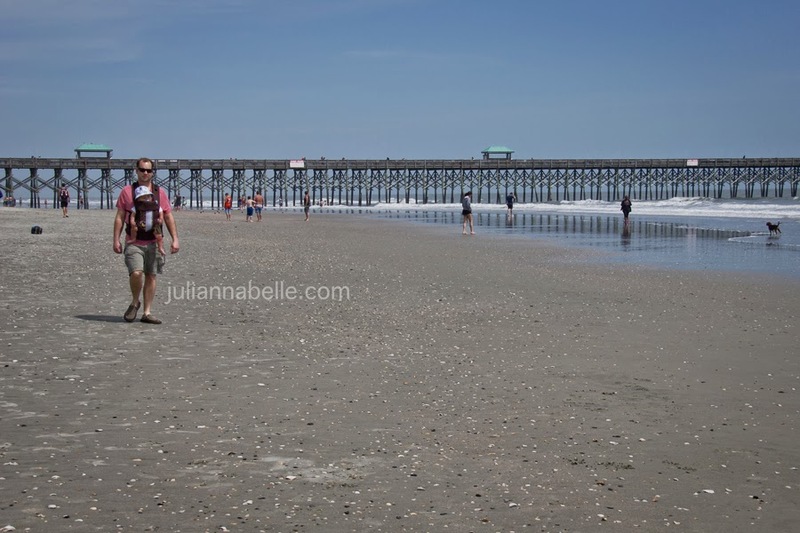 It looks like Julianna (love her name) had a wonderful time at the beach and Tyler loved it as long as his feet didn't have to touch the sand. I'm definitely looking forward to the summer and warmer weather in the next few months--beach days can't come fast enough. I'm glad you had a lovely visit! 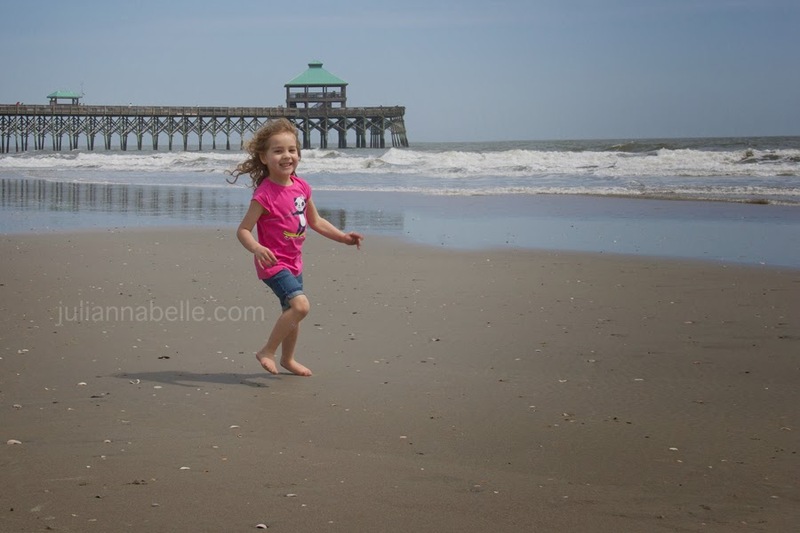 The photos are great, as uaual, especially because they show the adorable children having fun/or testing out the sand. You look very good. Admire the healthy dieting altogether. I keep trying that but bad things just call out to me and I can't resist sometimes. has healthier stuff, but at 10 p.m., I'm not walking there. than you kathy! tasting the sand too - lets not forget that haha! Bad things always call out to me too - but we don't keep anything bad in the house, so it helps a lot to not have it within arms length :) Have agreat day ! Sidewalk (or pavement as I would call it) chalk is a childhood essential! I have spent more time than I care to admit to chalking up the pavement outside out house with both my kids! 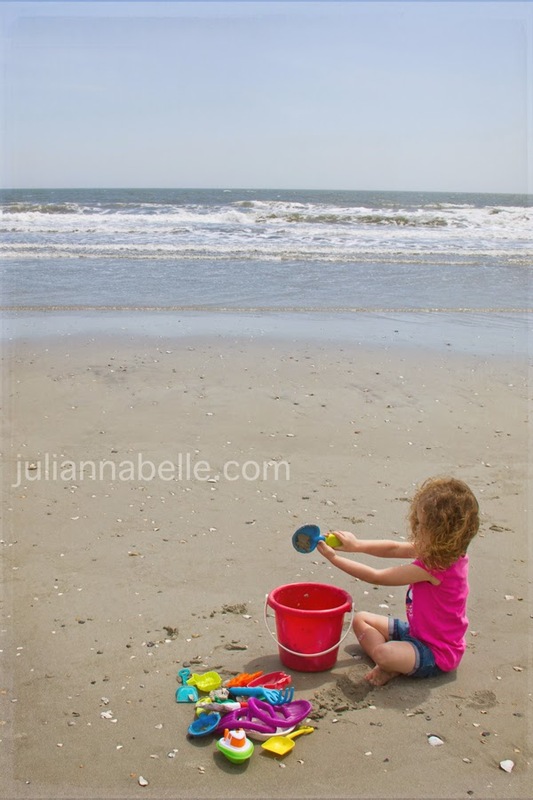 Seems like just yesterday Julianna didn't want anything to do with the sand. And now she's having so much fun like that was never the case. I may be a bit jealous of your beach trip, although it would be kinda overwhelming to take our three right now.